Located at breathtaking Lands End on the Pacific Beach of Cabo, and yet just a 5 minute walk to the Marina, and several minutes more to downtown Cabo nightlife, shopping, dining, and other activities. 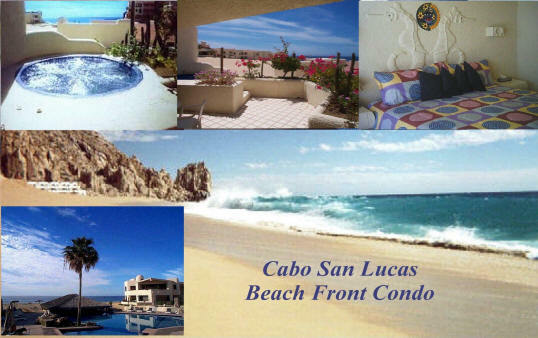 The most convenient and best Beach front Condo location in Cabo! Patio opens to Private Spa and Beach! Terrasol boasts Cabo's most convenient beach-front condo location. Our Sportcruisters depart from the dock just 5 minutes from the Condo, while the main town is just a few blocks out the front door. No need for taxis or car rentals! Condo opens to the Beach, unobstructed views of the Pacific Ocean, hear the Ocean as you sleep! Feel the warmth of Cabo with the Condos authentic Mexico art decor & dream of catching the big one - while viewing the 2 Marlin Mounts & Dorado Mount on the Condo walls! Amenities include: 2 swimming pools overlooking Pacific ocean one with Palapa bar and one saltwater, restaurant, and shade palapas with cushion lounge chairs, gated community with private beach. Condo faces Beach and Ocean! Charters from $225 to $895. Includes crew, fuel, all tackle, dispatch fees/tax, ice. *Air, transfers, tips, meals & fish filleting are not included. Rates & Packages subject to change without notice. Restrictions may apply. Rates valid 01/04-12/18 2017. Please call for rates on custom packages.